A baby walrus named Mitik, rescued from the ocean off the coast of Alaska, will be joining the exhibit at the New York Aquarium next spring. Now putting on a pound-a-day, a 15-month-old walrus rescued from the sea off the coast of Alaska has made his way to his new home on Coney Island. The New York Aquarium is one of very few aquariums that have walrus displays, and the two walruses who currently call it home are 30- and 17-years-old. The baby walrus, who is named Mitik, has been in captivity since his rescue in July. He was rescued alongside another baby walrus that has gone to live at the Indianapolis Zoo. Initially, Mitik was unable to drink from a bottle and had problems with his bladder. He now weighs in at 234 pounds. Staff at the aquarium will monitor him 24 hours a day until he is fully recovered. 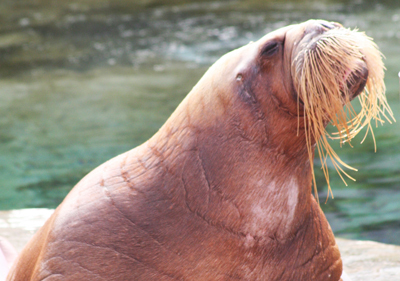 Male walruses, known for prominent tusks, whiskers and large, bulky bodies, can grow to more than 3,700 pounds. Walruses mostly live near continental shelves, spending most of their lives on sea ice and feeding off mollusks. Walruses are social animals that migrate within the northern pacific waters. Mitik will become part of the walrus exhibit next spring. He will spend his first month at the aquarium in quarantine, before meeting his new family members, Nika and Kula. Share your thoughts on this article by posting your comment below, or visiting our Long Island Living discussion forum. Subject: LongIsland.com - Your Name sent you Article details of "Baby Walrus Coming to New York Aquarium"